Surface re-texturing offers a quick and cost-effect ive way of maintaining skid-resistant road surfaces by restoring their micro and/or macro texture. The speed and efficiency of our technique significantly minimises works duration and, therefore traffic disruption. 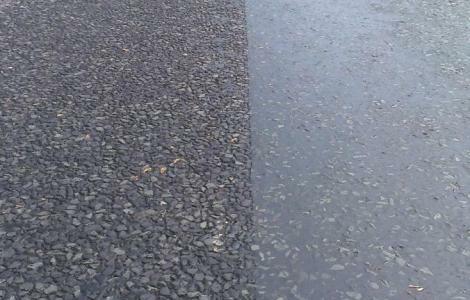 Water Jetting is the latest technology in road surface re-texturing & bitumen removal. Excess bitumen is removed from the road surface to restore the skid resistance and texture depth to safe and desired levels, with directed water jets of 40,000 psi on a rotating head. A captive vacuum recovery system removes all waste materials and surplus water. Suitable for wet or dry road surface 12 months of the year. Low water consumption and absolutely no chemicals used. An immediately-usable traffic area is left behind. The most advanced and environmentally friendly option . Removes all types of binders from bituminous surfaces safely and quietly. Our truck mounted unit has no need for men on foot during the removal process. Will also remove a range of other materials, including anti-skid. The single step process needs no secondary clean-up . Application widths from 200 to 600mm in a single pass. 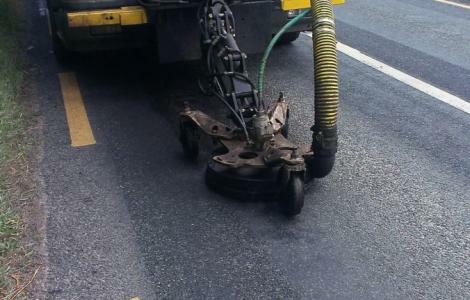 Vacuum recovery system leaves the road surface clean and almost dry.